I got really tired of searching for the little script that deletes everything every time I needed it and decided to store it inside the admin database. Deleting everything in a test MongoDB is a common operation for test and dev machines. It's a relatively simple operation that I have described here. After a little while, I got really tired of searching for the little script that deletes everything every time I needed it. Thus, I decided to store it inside the admin database. The solution is really simple. Just connect to the admin database and register a server-side function to delete all databases. Now, you can simply load all functions from the shell and execute the new DeleteAllDb function. 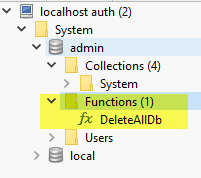 Now, you can avoid moving away from the script; just invoke the DeleteAllDb(db) function from the shell and you will delete all databases, except Admin and Local.